Each year about 100 million Americans make New Year's resolutions. Most vow to quit smoking, lose weight, or save more money. About 80% of them break their resolutions by the second week and feel like failures. It's not surprising. Making a New Year's resolution is easy. Keeping it is the hard part. I'm here to help. If you've broken your New Year's resolution to lose weight, it's OK. What's not OK is to use that slip-up as an excuse to abandon the resolution altogether. One of the biggest mistakes people make when trying to lose weight is to choose deprivation over moderation. Remember, you need to eat to lose weight. That's not an oxymoron. It's true. If you slash your caloric intake too severely, your metabolism will slow down to compensate, and you'll burn fewer calories. A better approach is to reduce your caloric intake by 200-250 calories per day and to increase your exercise. Over the next few days I'll share some delicious, simple, healthy recipes that will keep you full while helping you to lose weight. The key is to have a combination of lean protein (chicken, eggs, tofu, fish, beans), complex or "good" carbs (whole grains, fruits, vegetables), and monosaturated or "good" fats (olive oil, nuts, avocado). Today we'll start with the most important meal of the day: breakfast. When you're trying to lose weight and curb your appetite, eating a well balanced breakfast is essential. Studies have shown that people who eat a substantial breakfast with a mix of healthy protein, carbs, and fiber eat less throughout the day and burn more calores. 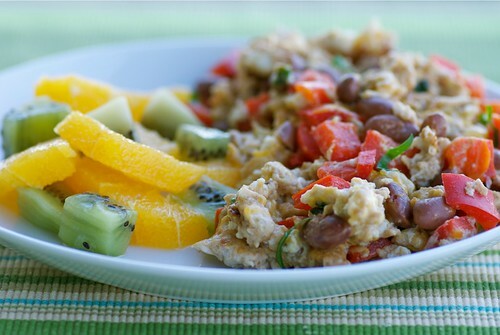 One of my favorite breakfasts is my Skinny Mexican Breakfast Scramble. Eggs often get a bad rap for being high in cholesterol, but they're also an excellent source of protein, and if you have only one yolk (which is the source of the cholesterol), you don't have to worry. Red bell peppers and beans add vitamin C and fiber which boost your immune system and keep you satiated, respectively. Salsa adds bold flavor with few calories while reduced fat cheese will help keep you full without packing on the fat. So, go ahead, eat up! 1. In a small skillet over medium heat, warm olive oil. Add scallions and pepper and saute 3 minutes, or until softened. In a small bowl whisk egg and whites and pour into skillet. Using a spatula or wooden spoon, gently move the eggs from side to side as they cook. When they are nearly done, add the salsa, beans, and cheese and stir well. Cook until eggs are no longer runny yet still soft. Sprinkle with cilantro and a couple of dashes of hot sauce, if using. I like to serve fresh fruit, such as 1 kiwi and 1 small orange (both vitamin C powerhouses), alongside my Skinny Mexican Breakfast Scramble. That looks yummy. I love all of the ingredients. I totally agree with your advice. I also never "diet". I am a fan of requiring myself to eat x number of fruits and veggies each day, walking the dogs a little longer, and drinking a little more water. If I still want a cookie after all that, well I just let myself have it. If I say I can't have a cookie, I'll find myself eating half the pan. sounds delicious...and i wouldn't even miss the fattier version! When I first started college, I NEVER ate breakfast but then in my junior year when I started to focus on losing weight and getting healthy I started...and now it's my favorite meal of the day! Can't wait to see the healthy recipes you're gonna share cause I'm on a health kick myself. This scramble sounds delicious! Just right on time. Reading this gives me an idea. I'm on a diet mode and that's also my New Year's resolution. I wanted to lose weight but I don't wanna stop eating. So I guess I found my guide! That looks good enough to convince me that I could cook for myslef in the morning! Instead I had a banana and peanut butter sandwich! Your post is thoughtful, accurate and inspiring - thanks! nicole-I don't diet either. I exercise more and try to cut back on calories. I'm with you on the cookie too. Deprivation leads to binging leads to self-loathing. Ugh. joanne-I agree! I actually look forward to breakfast now rather than viewing it as something I have to do. This is a great post. I loved using it in my class today because teens do not think that breakfast is that important. It was a very valuable lesson! A few things I'm trying. A small plate; I review each day and tell myself what I did right and what I could have lived without; I tell myself "I'm full!". I am all about a scramble with lots of veggies for breakfast! Yum!